Vincent Bach combined his unique talents as both a musician and an engineer to create Bach Stradivarius trombones, the most sought after trombone in today’s global market. Every Bach trombone is hand crafted, focusing on precision manufacturing and detail. Today, the Bach Stradivarius trombones remain the sound choice for the most discerning musicians worldwide. Trombone bores are a measurement of the inside diameter of the inner slide tubes. As the bore size changes so does the bell design. The shape of the tapered surface, or rate of flare, determines the characteristic sound of the trombone. Slow tapers yield bright tones, while fast tapers produce dark, warm sounds. Smaller bore trombones having bells with slower rates of taper, produce a brighter jazz sound. Larger bore trombones, having bells with faster rates of taper, yield darker symphonic tone qualities. Sterling bells create a full copliment of partials (overtones) in the tonal spectrum for a focused sound with great projection. For situations involving dark qualities or high dynamic levels without distortion, choose a heavyweight bell. Bach Stradivarius trombones are famous for their fullness of sound and projection. This is achieved by the use of one-piece construction, allowing for unrestricted vibration of the bell. In addition to the shape of the bell flare, the type and thickness of the bell material also affect the sound. 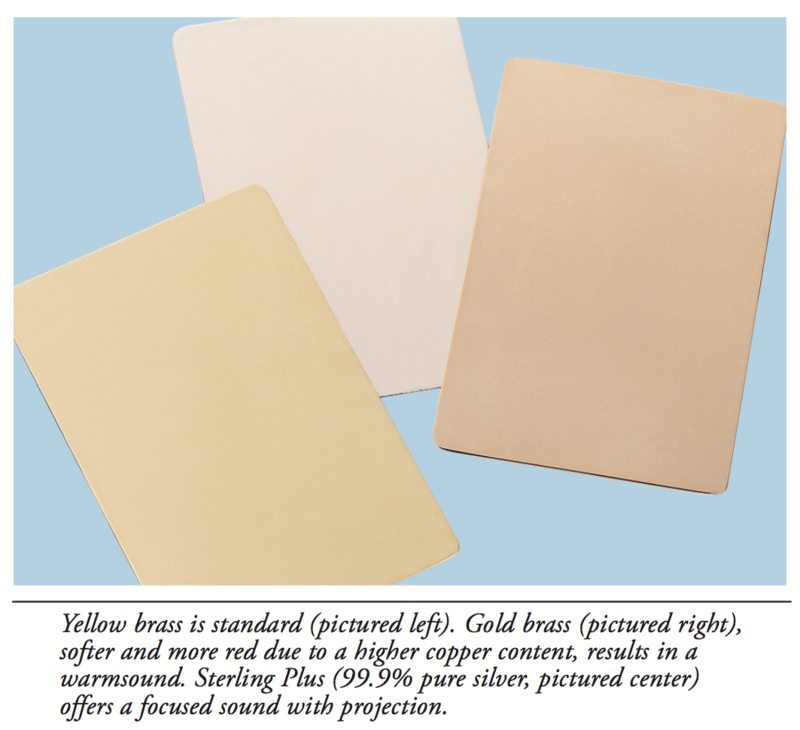 Gold brass, softer and more red than the standard yellow brass due to a higher copper content, results in a warm tone. The venturi (constriction) and rate of taper in the mouthpipe affect the trombone's characteristic sound. Bach offers several mouthpipe options. The gooseneck, a section of pipe located immediately after the handslide section, serves as a "choke" to further balance the blowing resistance.